Win a $1,000 scholarship for your graduating senior! Congratulations to the Class of 2012 on reaching this important milestone–and to all you parents out there, for raising such great kids! Just when you think your work is done, here’s one more way to help your grad–especially if you’re looking for college scholarships. 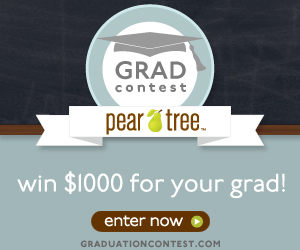 Enter our “If I’d Only Known” Grad Contest and you could win a $1,000 in cash for your grad, or a $100 or $50 gift toward Pear Tree graduation invitations and announcements. Mom and Dad, here’s what we’d like you to do. Not that long ago you were a high school graduate yourself–full of dreams, excited and scared, happy and sad all at the same time. You’ve learned a lot since then, and we’d like to find out just how much. Tell us something you wish you had known on your graduation day. What advice do you have for today’s grads (if they’d only listen)? To enter, submit a photo from your high school years along with your advice for today’s grads at http://gradcontest.peartreegreetings.com. Then get friends and family to vote for your entry! Winners will be chosen from the top ten vote-getting entries. Entries will be accepted until May 6, 2012, so get started now!